Browse our collection of 1 Sticker/Decal Sheets . Most designs are also available on T-Shirts, Tank Tops, Racerbacks, Sweatshirts, Hoodies and other items. Designed and printed in the USA. 100% Satisfaction Guaranteed. 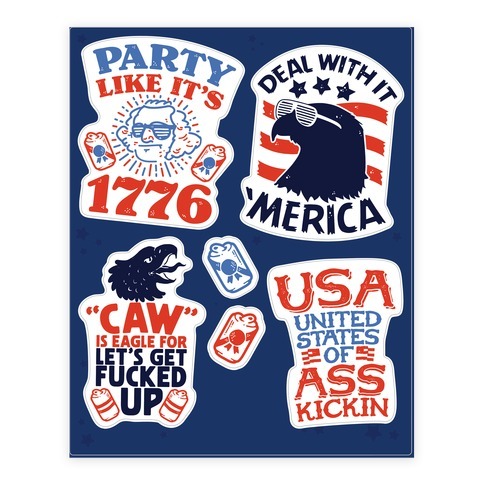 We offer our Merican 8" x 10" Sticker Sheets that are printed on gloss-white vinyl with weather-resistant ink. The waterproof vinyl and permanent adhesive of these stickers allow for both indoor and outdoor placement. Adhere stickers to a smooth, dry surface for best results. Printed in the USA.